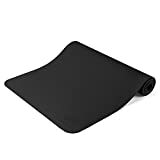 This black yoga mat measures 36″ wide, a full foot wider than standard mats. Our extra wide yoga mat provides many benefits for those looking for extra coverage. If you have wide shoulders and struggle with maintaining proper alignment (keeping wrists under shoulders) and staying on your mat, this new wide mat will help you. The combination of the longer length and the wider width provides more floor coverage to reduce the need to reposition yourself between poses. At 1/4″ thick, this mat provides good cushioning for Pilates routines as well. This extra-long, 84″ yoga mat is one of the longest available. A full 7′ of mat length to practice on should give most yogis head-to-toe coverage while lying in Savasana. Also available as an accessory to this mat is our “Rolling Sands Extra Long Yoga Mat Bag, Black” which is 38.5″ long with a 7″ diameter, designed specifically for this mat.